Book now to learn to bake stollen in time for Christmas! 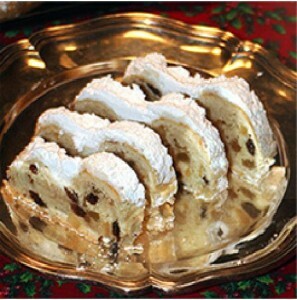 Stollen is a celebration bread with roots in Dresden where it was first mentioned officially in the fifteenth century. Like many types of celebration bread, stollen is enriched with delicious, expensive things to honour guests and celebrate religious holiday. Of course there is no single recipe for stollen. Typical enriching items are butter, eggs and milk; stollen-specific ingredients include ground almonds, dried fruit, citrus peel, rum or brandy, ground cardomom, and icing sugar. Stollen may or may not have a log of marzipan running through its middle. Although you can find stollen all over Germany, the most famous is from Dresden. Marked with the seal of King Augustus II, it is only baked by 150 bakers. Whether or not to put marzipan in stollen is a matter of personal taste. I did not grow up with it and actually prefer stollen without marzipan in it. What is not optional, however, is the fact that stollen has to mature before it tastes any good. Like any boozy fruit cake, stollen is best eaten old. Stollen bought from one of the 150 Dresden bakers is a seasonal product. It is baked in November in order to be ready for Christmas and when you buy it, it may come with instructions to NOT open it until a ceratin date. Once open it stays fresh for weeks but is incredibly good toasted as well. The alcohol preserves it, just like any good fruit cake, and I have never ever known one to go mouldy! Virtuous Bread has celebration bread classes all the time (bread is used to celebrate occasions all over the world!) and during the autumn we will teach students how to bake stollen. Come early if you would like to have it for Christmas as you do need to wait to eat it and it is best left maturing for several weeks! Don't worry, stollen is not the only thing we bake on this autumn's celebration bread course. So that you can have something to share as soon as you get home, we will also learn to bake cinnamon buns. Click here to book a place on a course to learn to bake stollen in London. Click here to buy a gift voucher for someone you love to come and learn how to bake. Now that is a gift that keeps on giving! attend the course because I am in Malaysia. I am very interested to learn how to make varieties of bread. Hello Sherul, thank you so much for your message! We have classes all year round and the schedule is normally posted three to four months ahead. In London, for example, the schedule is up to the end of August. If you click here: http://www.virtuousbread.com/make-bread-2/ you can choose the course you like and then the location and time. Classes are either 1/2 a day or a full day.